Can Ingram prove himself in Summer League debut? Maybe it will be another version of the Cinderella story Saturday night at the Thomas & Mack Center on the UNLV campus. Wendell Carter Jr. and Chandler Hutchison are hoping to ball and have a ball at the NBA’s Summer League cotillion in their professional debuts. They are who everyone among the Bulls will be looking at. But amidst that will the unrecognized and somewhat unappreciated talents emerge for the Chicago kid who was undrafted in May? Could his golden slipper be an NBA contract with the Bulls, becoming a rare Chicago prep, collegiate and NBA player? Simeon and Loyola’s Donte Ingram hopes so. "I’m just taking one day at a time, I’m not fast forwarding past this process," Ingram said after a morning practice. "Now I’m looking forward to getting a win tonight and go from there. You don’t want to get to this moment and be thinking too much, 'Am I going to get this spot? Am I going to be there?' That’s how you get distracted. I’m just focused on taking it game by game and the rest will take care of itself." Ingram is scheduled to be the fifth starter, a plug in at power forward, along with rookie hopes Carter and Hutchison and backcourt returnees Antonio Blakeney and Ryan Arcidiacono. "We want to simulate how we are going to play through the course of the year with a spacing four man like we have with Lauri (Markkanen)," Bulls coach Fred Hoiberg explained. "We’ve talked about Chandler some at three and four, but to start the year we want him playing the small forward position for us and see in training camp who get starters minutes. We want to simulate (here) how we are going to play with the big team. We thought Dante was the best option to start. He’s played very well. He can shoot, get the ball off the glass and push, a high IQ, very smart player, a really versatile kid. He’s shown us a lot." So while the attention will be on the first round draft picks, Ingram could emerge as one of those summer surprises and earn his way, at least, into training camp and perhaps the roster. As a footnote, only two players ever, Howie Carl from Von Steuben High School and DePaul and Andre Wakefield from Crane Tech and Loyola, went to Chicago high schools, colleges and then the NBA team, Carl with the old Chicago Packers who later moved to Washington. At 6-6 with defensive versatility as the potential modern, pace and space and 3 and D player, Ingram fits the profile of the rugged reserve type player who can impress in Summer League. And don’t worry about the attention and TV cameras with the growth of Summer League. 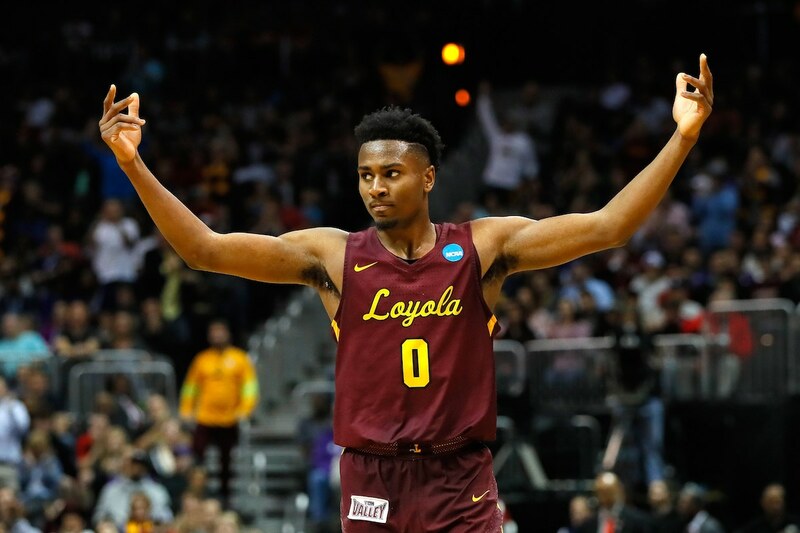 Ingram showed in Loyola’s own so called Cinderella NCAA tournament run to the Final Four this year that he knows it being about the shoes, too. Or the shot in his case, that opening game winner against Miami. "I think I bring versatility, toughness, shot making and defensive ability," Ingram said. "Those are things any team in the league can use. So I just want to come out and showcase that and hopefully I will be in a good spot. Obviously, being on that big a stage in college in the tournament and having that success and playing on this huge stage it’s a huge help," he added. "I look at this as another stage I’ve been on before. So coming in I’m pretty confident and looking forward to doing what I can to helping the team win." Ingram’s is just another one of those wonderfully possible sporting King Arthur stories, a central Illinois Danville kid who played with the Chicago guys in the summers. Superstar Jabari Parker took a liking to him and helped persuade Ingram to transfer to Simeon as a junior. Ingram wasn’t even a starter on that championship team. Which, he points out, may prepare him even better now for his goal. "We had the No. 1 player in the nation, Jabari," Ingram pointed out. "We had Kendrick Nunn, who is here with Golden State, playing very well, Jalon Tate (who played at Illinois and now professionally in Canada). Look down the line. That was great players who were seniors. For me, it’s never about starting or coming off the bench. Getting in a rotation in the NBA, you have to realize and accept your role. I just want to come in and impact the game the best I can." "You have to be realistic and know your role," Ingram pointed out. "One of the biggest things in the NBA is role acceptance. At one point, everybody in the NBA was the man somewhere, whether it was high school or college. But when you get to that next level, you have to be able to buy into a role and understand that. You have Zach LaVine, Denzel Valentine, Wendell, Chandler, guys like that who are going to be in those positions. For me, I just have to come in and do what I can do to help the team win, understand I might not get 15 shots a game, I might get five. But when I get those five, I have to be ready." In many respects, Ingram’s has been a career of sacrifice for the team, even as a senior at Simeon often deferring as a playmaker and then at Loyola in their New York Knicks-like 1970s, offensive sharing game. It didn’t get him drafted, but being overlooked has never held back Ingram. "I was on teams’ radar for the second round, but the draft isn’t the end of the world for me," Ingram said. "Only 60 people can get drafted. There’s more people and plenty of undrafted players who have gone on to have great success. I don’t let that phase me. I know what I am capable of, so I am just looking forward to working and making the team. You grew up seeing Summer League and seeing guys play well in this and start their careers off in a great way with momentum going into the season. Not everybody gets this opportunity, so I am blessed to be here and happy to get going tonight."